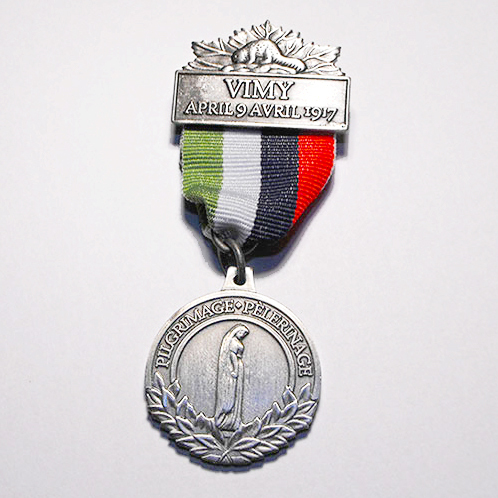 To salute Canadian youth for making the pilgrimage to the Vimy Memorial on April 9, 2007 for the 90th anniversary celebrations, the Vimy Foundation awarded each student a medal similar to that given in 1936 to the original pilgrims: First World War veterans attending the original inauguration. 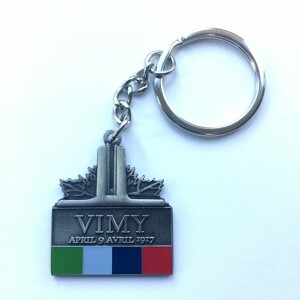 These medals are now available to all Canadians to honour their trip to the Vimy Memorial. 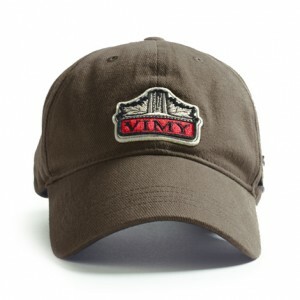 All proceeds from medal and pin sales fund Vimy Foundation activities. On the top of the clasp is an elongated Canadian maple leaf, which has been used as a Canadian symbol since the early 1700s. Within the maple leaf is the iconic beaver, which was first used as a Canadian symbol as early as 1621. 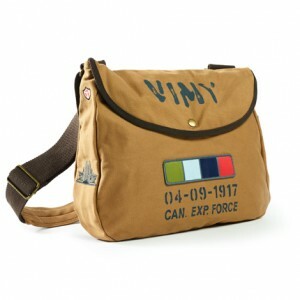 On the clasp bar is the text “Vimy – April 9 Avril 1917”, saluting the first day of the Battle of Vimy Ridge. 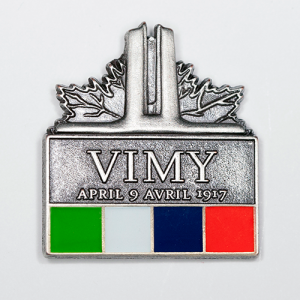 The four vertical bands represent the four Canadian divisions which fought together for the first time on April 9, 1917 at the Battle of Vimy Ridge. The red represents the First Division, the dark blue the Second Division, the grey-blue the Third Division, and the green the Fourth Division. The order of the ribbon’s (left to right) colours reflects the positioning of the Canadian Divisions facing the German defences on the day of the battle. The word “Pilgrimage” (with the French “Pèlerinage”) was a term first used for the official return of 8,000 veterans to the official unveiling of the Monument by King Edward VIII in 1936. In the centre is the statue of “Canada mourning her Fallen Sons”, which is a central component of the Vimy Ridge Memorial and is set above the stone sepulchre representing Canada’s First World War dead. “Canada“ looks down mournfully upon the supreme sacrifice of Canadian manhood for the causes of Liberty and Peace, and holds in her hand the laurel of victory: however, the laurel hangs listlessly by her sagging body with her face showing no sign of victory, only sorrow. The wreath of laurel located at the bottom of the coin symbolizes both the victory and honour gained by Canadian forces at Vimy Ridge. In the centre of the coin is represented the magnificent Vimy Memorial designed by Walter S. Allward, built between 1925 and 1936 by the Canadian Government on land given to the nation by France to honour Canada’s First World War sacrifice of 60,000 dead.